I'm going to visit my oral surgeon today to check up on my tumor. And because he'll be poking around my mouth I can't wear lipstick. So I decided to go ham on my eyes!!! This is the look i'm going with today!! Base: I started off with Hard Candy green tinted primer on my cheeks and forehead, then MUFE Mattifying primer on my T zone. I then buffed MUFE Mat Velvet+ foundation all over my face. I then patted a pink tinted sheer concealer to brighten my under eye area. Then I patted Hard Candy Glamoflauge under my eyes. I took a fluffy brush and patted Rimmel Clear skin powder all over my skin. Then I buffed Sephora Brand Matte perfection powder foundation all over. Lastly I spritzed MUFE Mist and Fix all over to lock everything in! Cheeks: I made a custom cheek colour today! 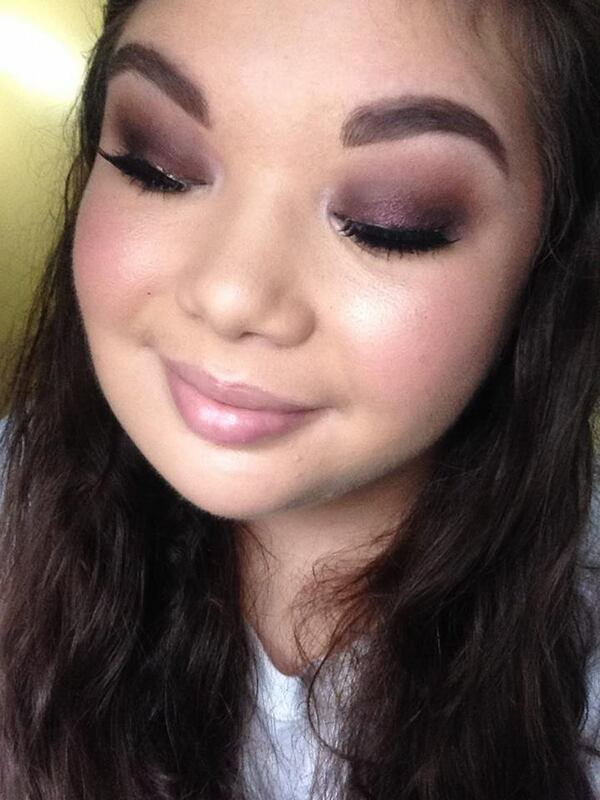 I started with Makeup Geek Romance (Shimmery golden coral) and then I blended Makeup Geek Soulmate ontop! 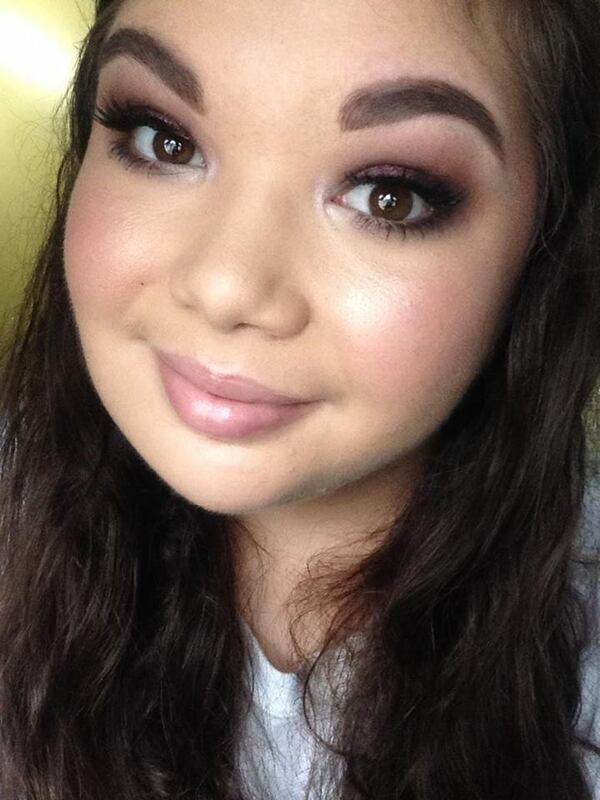 (Matte plummy pink) I lastly took The balms Mary Loumanizer, and I blended that along my cheek bones!! Eyes: I started with patting in ELF sheer primer from lashline to brow bone. I then took Tarte Whisper (Matte cream shadow) and set the primer. I took a mauvey lilac shadow from a Sonia kashuk quad, and buffed that through the crease and up onto my hood. I patted Colourpop Stero (Black base with purple glitter) onto my mobile lids, then took Tarte BFF (Matte dark purple) and I blended that out into my crease and used that to blend out any harsh lines!! 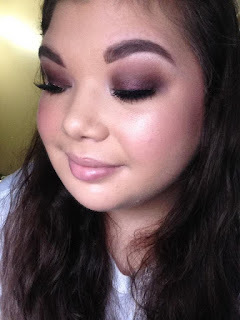 I wanted it to be super deep and dramatic so I took Coastal Scents Cherry Chocolate (Dark dark brown base with purple shimmer through out) and lightly LIGHTLY blended that trough my outer V. I added mascara to my upper lashes, then falsies, and buffed Tarte BFF on my lower lashline, then added mascara to my lower lashes. 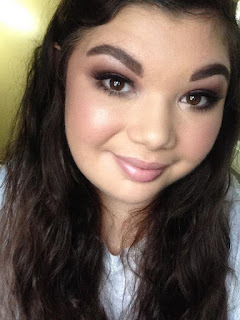 Brows: I ran through my brows with Essence make me brow, and then took Annabelle brow to go dark powder on an angled brush and blended that through my brows adding colour, and sharpening the brow shape. I then re applied another coat of Essence make me brow! Lips: Just Jack Black Lip balm in Mint! I hope you all enjoyed this look!! I really like it! !